Purpose: To assess the visual outcomes at one-year follow-up after pan-retinal photocoagulation (PRP) in type 2 diabetes mellitus subjects with proliferative diabetic retinopathy (PDR) and associated risk factors. Materials and Methods: A retrospective study, using data from medical records of 5000 Type 2 diabetic patients who underwent a retinal examination between 1995 and 1999 at a diabetic centre. Ocular, clinical and biochemical parameters were assessed at baseline and at one-year follow-up after PRP. Diabetic retinopathy (DR) was documented by colour photography and PRP was performed according to the ETDRS criteria. Results : PRP was done in 413 eyes, of which 261 eyes of 160 subjects were eligible for the study. One hundred and forty eyes (73%) of 191 eyes with good visual acuity (6/9) at baseline maintained the same vision at one-year follow-up. Of the 53 eyes with visual acuity of 6/12-6/36 at baseline, 58.5% (31 eyes) maintained same vision and 18.9% (10 eyes) improved their vision at one-year follow-up. Of the 17 eyes with visual acuity £6/60 at baseline, 12 maintained the same vision and the remaining 5 improved their vision. The causes of visual loss included vitreous haemorrhage in 20 subjects (31.7%), progression of cataract in 19 (30%), chronic macular oedema in 15 (23.8%), pre-retinal haemorrhage in the macula in 6 (9.5%) and pre-retinal fibrosis in the macula in 3 (4.7%) subjects. On multiple logistic regression analysis, diastolic blood pressure ( P =0.03), duration of diabetes ( P =0.006), fasting blood glucose ( P =0.02) and nephropathy ( P =0.01) were associated with decreased vision after PRP. Glycated haemoglobin (HbA1c) ( P <0.001), serum creatinine ( P =0.03), HDL cholesterol ( P =0.05), diabetic neuropathy ( P <0.001), hypertension ( P =0.01) and diabetic nephropathy ( P <0.001) showed a significant association with PDR. Conclusion: Visual acuity at baseline, the duration of diabetes and proteinuria played a significant role in determining the post-PRP visual acuity. Few studies have reported on the visual outcomes after PRP. The beneficial effect of PRP on visual outcome is directly related to the concomitant treatment of retinopathy risk factors. Thus identifying the risk factors of PDR and the visual outcomes after PRP in diabetic patients would result in effective treatment of the patient as a whole, thereby reducing failure rates. The aim of the present study was to assess the visual outcomes one year after pan-retinal photocoagulation for proliferative diabetic retinopathy in type 2 diabetic patients attending a specialised diabetic eye care centre. This is a retrospective analysis of medical records of 5000 type 2 diabetic patients who underwent retinal examination between 1995 and 1999 at the Dr. Mohans' M.V. Diabetes Specialities Centre, Chennai, India. Four hundred and thirteen eyes of 288 type 2 diabetes mellitus patients with PDR underwent PRP during that period. A list of patients diagnosed with PDR was obtained from a computerised registry of diagnostic codes maintained by the diabetic retinopathy unit at the centre. Of these, 261 eyes of 160 subjects were eligible for the study (defined as those subjects who had at least one eye treated with PRP and were followed up for at least one year). Subjects for whom the biochemical and clinical parameters were not available at baseline and subjects who did not have a follow-up for a year were excluded. Age, gender, and duration-matched 160 type 2 diabetic subjects without diabetic retinopathy served as controls for risk factor analysis. Data collected from the patients' records included patients' age, gender, duration of diabetes mellitus, age at onset of diabetes mellitus, presence or absence of hypertension, body mass index, use of insulin or oral hypoglycaemic agents, presence of other systemic diabetic complications and other general illnesses. Ocular parameters were assessed at baseline and at one-year follow-up by recording the best-corrected visual acuity, intraocular pressure, slitlamp examination, retinal examination, stereo colour fundus photographs and fundus fluorescein angiography (FFA). Best-corrected visual acuity was recorded by Snellen's visual acuity chart and analysis performed using the Snellen's reciprocal. If the visual acuity was <1/60, it was denoted as counting fingers, hand movements, light perception, or no light perception. Poor visual acuity was defined as a corrected visual acuity < 6/60 on the Snellen's chart in the eye that received PRP. Intraocular pressure was recorded with the Schiotz tonometer by trained optometrists. Slitlamp examination details including the presence or absence of cataract was documented. Density of cataract was graded from 0 to 6. Nuclear sclerosis was graded from +1 (mild) to +4 (very dense). Cortical and posterior subcapsular cataracts were each given an additional score of +1. Detailed fundus examination was done by trained ophthalmologists using direct and indirect ophthalmoscopy. Fundus examination included slitlamp biomicroscopy with 90 D or 78 D lens. Four-field colour retinal photography was performed with the Topcon TRC50-VT (Topcon, Tokyo, Japan) or Zeiss FF 450 cameras (Carl Zeiss Ltd, Jena, Germany) using 35mm colour transparencies. The areas photographed included stereo pictures of the macula, disc, superior-temporal and inferior-temporal quadrants. The photographs were coded and assessed using the Donaldson's viewer. The photographs were graded using modified version of the ETDRS grading system, ,  which has been previously described. FFA was performed in all cases before laser therapy. The presence of Clinically Significant Macular Oedema (CSME) as defined in the ETDRS  was recorded at baseline and at one-year follow-up. Patients who had CSME were first treated with appropriate focal or grid macular laser therapy before initiating the PRP. [1 3] The presence of diabetic macular oedema and the location and extent of neovascularisation were assessed based on patients' charts, colour fundus photographs and FFA pictures. The presence of active neovascularisation of disc (NVD), neovascularisation elsewhere (NVE), vitreous haemorrhage, pre-retinal haemorrhage, fibrous proliferans and traction retinal detachment were recorded at baseline and at one-year follow-up after PRP. Treatment of PDR was done according to the guidelines provided in the Early Treatment Diabetic Retinopathy Study (ETDRS). ,  A complete PRP was performed with Coherent Argon laser-920A (Coherent, Cambridge, UK) with wavelength of 488-514 nm or a Zeiss Visulas Frequency doubled Nd: Yag diode pumped, continuous wave laser (Carl Zeiss Ltd, Jena, Germany) with wavelength of 532 nm. A total number of 2500-3000 burns were delivered using 300-500m spot sizes in two to three sittings. The number of visits and the number of burns needed to complete the initial treatment was also recorded. The need for additional laser treatment was decided by the clinical presentation, which was documented by colour photographs and FFA at 3-6 months and at one-year follow-up examinations. If the lesions persisted, further scatter photocoagulation was done. In cases of non-resolving vitreous haemorrhage affecting the vision or a traction retinal detachment, the patients were referred for vitrectomy and endolaser photocoagulation. Clinical and biochemical parameters at baseline and at the one-year follow-up were analysed. All biochemical parameters were carried out on a Corning Express AutoAnalyser (Corning, Medfield, MA, USA). Fasting and 2-hour plasma glucose (glucose oxidase method), serum cholesterol (CHOD-PAP method) and serum triglycerides (GPO-PAP method) were measured using kits supplied by Boehringer Mannheim (Mannheim, Germany). HDL cholesterol was estimated by CHOD-PAP method after precipitating low-density lipoprotein and chylomicron fractions by addition of phosphotungstic acid in the presence of magnesium ions and very low-density lipoprotein (VLDL). Low-density lipoprotein (LDL) cholesterol was calculated using the Friedewald formula. Serum creatinine was estimated using Jaffe' method (Randox, Crumlin, UK). Glycated haemoglobin (HbA1c) was estimated by high-pressure liquid chromatography using the variant machine (Bio-Rad, Hercules, CA, USA). Proteinuria was estimated by the sulphosalicylic acid method. Visual acuity was defined 'stable' when vision at baseline was maintained after PRP; 'decreased' when the baseline vision decreased by³³2 lines; and 'improved' when the baseline vision improved by ³2 lines after PRP at the end of one year. All the data were computed on FoxPro database and statistical analyses were done using SPSS PC windows version 10 (Chicago, IL). The students' "t" test was used to compare continuous variables between groups and the paired 't' test was used to compare continuous variables within the group. P values <0.05 were considered significant. Multivariate logistic regression analysis was performed to determine the risk factors associated with decreased vision (every one line decrease in visual acuity from baseline vision) at one-year follow-up. Decreased vision was used as the dependent variable and the independent variables included age, body mass index, duration of diabetes, systolic and diastolic BP, fasting blood glucose, post-prandial blood glucose, glycated haemoglobin (HbA1c), total cholesterol, serum triglyceride, HDL cholesterol, serum creatinine, microproteinuria and macroproteinuria at baseline. To determine the risk factors of PDR, stepwise multivariate logistic regression analysis was also performed using PDR as dependent variable and the risk factors, age, gender, body mass index, duration of diabetes, fasting blood glucose, postprandial blood glucose, HbA1c, total cholesterol, serum triglyceride, HDL cholesterol, serum creatinine, hypertension, IHD, neuropathy and nephropathy at baseline as independent variables. A total of 413 eyes of 288 patients had received PRP during the study period. Two hundred and ninety five eyes of 192 patients had a follow-up examination done at the end of one year, and 118 eyes of 96 patients were lost to follow-up after the first year of treatment for various reasons like change of address, unreported death, other debilitating diseases, etc. As they did not meet the inclusion criteria, they were eliminated from the study. Of the 295 eyes, 34 eyes of 32 patients had PRP elsewhere and were followed up at one year at our centre, however since their systemic and ocular examination details at baseline were not available, these patients were not included in the study. Thus a total of 261 eyes of 160 patients were subjected to analysis. Among the 160 patients 101 subjects had bilateral PRP at baseline. The mean age of the study group was 53 ± 9.1 years and of the control subjects was 54 ± 11.5 years. Sixty-five per cent of the study subjects were males. The mean duration of diabetes was 14.4 ± 6.4 years in the study group and 14.0 ± 6.7 years in the control group. [Table - 1] compares the clinical and biochemical features of the control group and the study subjects at baseline and at one-year follow-up after PRP. The study group had higher levels of fasting plasma glucose ( P =0.011), HbA1c levels ( P <0.001), serum cholesterol ( P =0.006), serum creatinine levels ( P =0.001), systolic and diastolic blood pressure ( P =0.001 and P =0.002 respectively) and macroproteinuria ( P <0.001) at baseline compared to the control group. There was no significant difference among the control and study groups with regard to body mass index, post-prandial blood glucose, and HDL cholesterol at baseline. However, within the study group, at baseline fasting blood glucose ( P =0.028), postprandial blood glucose ( P =0.009) and HbA1c levels ( P <0.001) were higher and serum creatinine ( P =0.002) levels were lower compared to the one-year follow-up. In these patients NVE was observed in 77.8% (203 eyes), NVD in 33.3% (87 eyes) and tractional retinal detachment was present in only 1.2% (3 eyes) at baseline among the 261 eyes. Vitreous haemorrhage and pre-retinal haemorrhage was observed in 21 (13.0%) and 22 (13.8%) study subjects at baseline respectively. Of the 261 eyes, 28 eyes (10.7%) had undergone cataract surgery, none of these received YAG capsulotomy during the period of follow-up. Prior to PRP, nerve palsy was reported in 3 eyes, and 2 subjects were on therapy for open angle glaucoma. Retinal vein occlusion (2 eyes), corneal degeneration (1 eye) and heterochromia iridis (1 eye) were other eye disorders documented. Intraocular pressure both at baseline and at one-year follow-up after PRP did not influence the visual outcome in this cohort. At baseline, 191 (73.2%) eyes had visual acuity of 6/9 or better, 53 (20.3%) eyes had visual acuity of 6/12-6/36 and 17 (6.5%) eyes had visual acuity of £6/60. The odds ratio (OR) was computed for visual acuity taking ³6/12 as the reference category. The analysis suggested that patients with PDR had a 4-fold risk for decline in vision (<6/12) compared to the controls (OR:4.4; CI 1-8-11.0, P <0.001). Figures 1, 2 and 3 show the distribution of vision at baseline and one year after PRP [Figure - 1], [Figure - 2], [Figure - 3]. Data revealed that one of the main risk factors for developing poor visual acuity at one year was the baseline visual acuity. This was supported by the finding that 140 (73%) of 191 eyes with visual acuity ³6/9 at baseline maintained ³6/9 vision or improved at one year and 12 (70%) of 17 eyes with visual acuity of £6/60 vision at baseline maintained £6/60 at one-year. However, 5 eyes (30%) with a visual acuity of £6/60 at baseline improved to 6/36-6/12 at the one-year follow-up. The predominant causes of visual loss at one year after PRP was vitreous haemorrhage in 20 subjects (31.7%) and the other causes included progression of cataract in 20 (30%), chronic macular oedema in 15 (23.8%), pre-retinal haemorrhage at macula in 6 (9.5%) and pre-retinal fibrosis at macula in 3 (4.7%) subjects. Of the 261 eyes, 16 eyes (6.1%) were referred for vitrectomy. Post PRP visual acuity at one year demonstrated a strong correlation with the duration of diabetes as shown in [Figure - 4]. With £10 years of diabetes 44 (72.1%) subjects retained the same vision, the vision improved in 7 (11.5%) subjects and there was a decrease in vision in 10 (16.4%) subjects. In patients with more than 20 years of diabetes, 22 (51%) retained same vision, and only 3 (7%) had improved sight. Eighteen eyes (41.9%) with ³ 20 years of diabetes duration were found to have decreased vision at one year following PRP as compared to 45 eyes (20.6%) of patients with <20 years of duration, indicating the significant association of post PRP visual acuity with duration of diabetes. Duration of diabetes played a major role even in eyes that retained the same vision ( P =0.028) following PRP at one year. Among the eyes with vision ³6/9 at baseline and duration of £10 years of diabetes, only 2 eyes (2%) developed poor visual acuity (£6/60) at the end of one year, whereas 9 eyes (22%) of patients with duration of >20 years developed poor visual acuity (£6/60) at one year. This is consistent with the guidelines shown in the ETDRS that when PRP is initiated early visual prognosis is better. At baseline, the risk factors which had a positive association with decreased vision compared to the individuals with normal vision at one-year follow-up on multiple logistic regression model analysis, were duration of diabetes (OR-1.2, CI-1.1-1.3, P =0.006), diastolic blood pressure (OR-1.1, CI-1.0-1.12, P =0.03), fasting blood glucose (OR-1.0, CI-1.0-1.01, P =0.02) and macroproteinuria (nephropathy) (OR-7.6, CI-1.6-35.8, P =0.01). Prevalence of hypertension (61.9% [n=99], P <0.001) was significantly higher in the study group compared to controls. 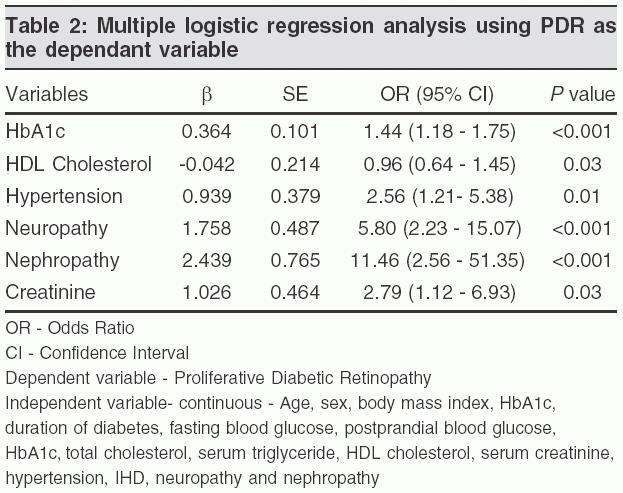 Significant independent predictors of PDR, determined by multivariate logistic regression model with stepwise analysis were higher fractions of HbA1c, serum creatinine, neuropathy, hypertension, nephropathy and lower levels of HDL cholesterol [Table - 2]. The present study attempted to evaluate the visual outcomes of PRP and its associated risk factors. In the ETDRS, vitreous or pre-retinal haemorrhage was the major cause of visual loss and this is an important indicator for serious intraocular disease. In a long-term study (10 years) on the visual outcome of PRP for PDR, progression of lens opacities, chronic macular oedema, vitreous haemorrhage, macular traction, and neovascular glaucoma were the main causes of visual loss. In our study, vitreous haemorrhage and progression of lens opacities were the most common causes of severe visual loss followed by chronic macular oedema, pre-retinal haemorrhage and pre-retinal fibrosis at the macula. In our study, duration of diabetes was an important determinant of the post PRP vision at one-year follow-up. This was shown by the fact that 41% of eyes in patients with more than 20 years of diabetes had decreased vision as compared to only 20% of eyes in those with less than 20 years of duration, at one-year follow-up. Poor vision at baseline was an important risk for visual prognosis at one year after PRP. 73.2% of patients who had 6/9 or better vision at presentation maintained it at the one-year follow-up compared to 14.3% patients who had visual acuity less than 6/9 at baseline. In the WHO Multinational Study of vascular disease in diabetes, positive odds ratios for PDR were obtained for age, duration, insulin treatment, cholesterol, proteinuria and fasting glycaemia. The results of our study are consistent with this study. HbA1c, HDL cholesterol, duration, neuropathy, hypertension and nephropathy were significant risk factors for PDR subjects who received PRP. We also found an association with declining visual acuity and PDR. We did not find an association with insulin treatment in this cohort. Proteinuria was one of the six risk factors identified for severe visual loss despite PRP, during the first 5 years after randomisation in the DRS. Multiple logistic regression analysis in our study also revealed that macroproteinuria (nephropathy) was a significant risk factor for decreased vision compared to the individuals with normal vision at one-year follow-up. It has been elegantly demonstrated in both the ETDRS and the Wisconsin Epidemiologic Study of Diabetic Retinopathy (WESDR) that dyslipidemia, independent of glycaemia, is also associated with an increased risk of developing retinopathy although the results have not been consistent. -  In another clinic-based study, it was noted that type 2 diabetic subjects, had an increase in the lipid peroxidation in plasma; this is accentuated in patients with diabetic complications. ,  In our study PDR was not associated with serum cholesterol, triglyceride and LDL cholesterol but showed a strong association with decreased serum HDL cholesterol levels. Data from the United Kingdom Prospective Diabetes Study (UKPDS) and other epidemiological studies have shown that progression of retinopathy was associated with older age, male gender and glycaemia (as evidenced by higher HbA1c). ,, In this study HbA1c levels were positively associated with PDR, however there was lack of correlation with fasting and postprandial blood glucose levels, possibly due to the fact that the patients were on intensive insulin therapy or oral hypoglycaemic drugs after PDR was diagnosed. Hypertension has often been shown as a risk factor in the development of retinopathy , ,, and a 34% reduction in the progression of retinopathy (by two steps on the early detection of diabetic retinopathy study chart) was demonstrated in the UKPDS in those treated intensively for hypertension. This is consistent with our study, where we found a strong correlation of PDR with hypertension in subjects who received PRP. As reported in Korean  and Japanese  type 2 diabetic subjects with PDR, presence of nephropathy had a statistically significant association with PDR in the current study. Similar observations were also found in our clinic-based study. This suggests a need for concurrent management of retinopathy integrated with the treatment of co-morbidities. One of the limitations of the current study was the retrospective nature. Only prospective longitudinal studies can give a true estimate of risk factors for PDR. In conclusion, in this retrospective study, visual acuity at baseline (OR 4.4 for vision ³6/12), duration of diabetes (OR 1.2) and proteinuria (OR 7.6) played a significant role in determining the post PRP visual acuity. The predictive risk factors associated with PDR are hypertension (OR 2.6), nephropathy (OR 11.5) and neuropathy along with increased HbA1c (OR 1.4), serum creatinine (OR 2.8) and decreased HDL cholesterol (OR 1.0). This strongly suggests that concomitant treatment of the co-existing conditions with diabetic retinopathy will result in better visual prognosis after PRP. Meyer-Schwickerath G. Light coagulation (translated by Drance SM). St Louis: Mosby; 1960. Snyers B. Proliferative diabetic retinopathy: Laser photocoagulation treatment. Bull Soc Belge Ophtalmol 1995;256:87-94. Chaine G, Massin-Korobelnik P. Treatment of diabetic retinopathy by photocoagulation. Indications, methods and results. Diabete Metab 1993;19:414-21. Kaiser RS, Maguire MG, Grunwald JE, Lieb D, Jani B, Brucker AJ, et al . One-year outcomes of pan retinal photocoagulation in proliferative diabetic retinopathy. Am J Ophthalmol 2000;129:178-85. The Diabetic Retinopathy Study Research group. Photocoagulation treatment of proliferative diabetic retinopathy: Clinical application of Diabetic Retinopathy Study. DRS report number 8. Ophthalmology 1981;88:583-600. Early Treatment Diabetic Retinopathy Study Research Group. ETDRS report no.7: Early Treatment Diabetic Retinopathy Study design and baseline patient characteristics. Ophthalmology 1991;98:741-56. Vander JF, Duker JS, Benson WE, Brown GC, McNamara JA, Rosenstein RB. Long-term stability and visual outcome after favorable initial response of proliferative diabetic retinopathy to pan retinal photocoagulation. Ophthalmology 1991;98:1575-9. Ferris FL, Kassoff A, Bresnick GH, Bailey I. New visual acuity charts for clinical research. Am J Ophthalmol 1982;94:91-6. Moss SE, Meuer SM, Klein R, Hubbard LD, Brothers RJ, Klein BE. Are seven standard photographic fields necessary for classification of diabetic retinopathy? Invest Ophthalmol Vis Sci 1989;30:823-8. Classification of diabetic retinopathy: detailed grading of stereo-color photographs. In: Early Treatment Diabetic Retinopathy Study Manual of Operations. Baltimore, Md: Early Treatment Diabetic Retinopathy Study Coordinating Centre. Dept. of Epidemiology and Preventive Medicine. University of Maryland 1985. p. 18. Early Treatment Diabetic Retinopathy Study Research Group: Grading diabetic retinopathy from stereoscopic colour fundus photographs - an extension of the modified Airlie House Classification. ETDRS Report. Ophthalmology 1991;98:786-806. Rema M, Deepa R, Mohan V. Prevalence of retinopathy at diagnosis among Type 2 diabetic patients attending a diabetic centre in South India . Br J Ophthal 2000;84:1058-60. Early Treatment Diabetic Retinopathy Study Research Group. ETDRS report no.4: Photocoagulation for diabetic macular oedema . Int ophthalmol Clin 1987;274:265-72. Early Treatment Diabetic Retinopathy Study Research Group. ETDRS report no. 2: Treatment techniques and clinical guidelines for photocoagulation of diabetic macular edema. Ophthalmology 1987;94:761-74. Early Treatment Diabetic Retinopathy Study Research Group. ETDRS report no. 3: Techniques for scatter and focal photocoagulation treatment of diabetic retinopathy. Int Ophthalmol Clin 1987;274:254-64. Friedewald WT, Levy RI, Fredrickson DS. Estimation of the concentration of low- density lipoprotein cholesterol in plasma without use of the preparative ultracentrifuge. Clin Chem 1972;18:499-502. The Sixth Report of the Joint National Committee on Prevention, Detection, Evaluation, and Treatment of High Blood Pressure. Arch Intern Med 1997;1557:2413-46. Rose GA, Blackburn H, Gillum RF, Prineas RJ. Cardiovascular survey methods. 2nd Ed. Minnesota code for resting Electrocardiograms. Minnesota Code 1982, p. 124-43. Mohan V, Meera R, Premalatha G, Deepa R, Miranda P, Rema M. Frequency of proteinuria in type 2 diabetes mellitus seen at a diabetes centre in southern India. Postgrad Med J 2000;76:569-73. Young MJ, Breddy JL, Veves A, Boulton AJ. The prediction of diabetic neuropathy foot ulceration using vibration perception thresholds. Diabetes Care 1994;17:557-60. Fong DS, Ferris FL 3rd, Davis MD, Chew EY. Causes of severe visual loss in the Early Treatment Diabetic Retinopathy Study: ETDRS Report No. 24. Am J Ophthal 1999;127:137-41. Dogru M, Nakamura M, Inoue M, Yamamoto M. Long-term visual outcome in proliferative diabetic retinopathy patients after panretinal photocoagulation. Jpn J Ophthalmol 1999;43:217-24. Keen H, Lee ET, Russell D, Miki E, Bennett PH, Lu M. The appearance of retinopathy and progression to proliferative retinopathy: The WHO Multinational Study of Vascular Disease in Diabetes. Diabetologia 2001;44(Suppl 2):S22-30. Kaufman SC, Ferris FL 3rd, Seigel DG, Davis MD, DeMets DL. Diabetic Retinopathy Study Report #13.Factors associated with visual outcome after photocoagulation for diabetic retinopathy. Invest Ophthalmol Vis Sci 1989;30:23-8. Chew EY, Klein ML, Ferris FL 3rd, Remaley NA, Murphy RP, Chantry K, et al . Association of elevated serum lipid levels with retinal hard exudate in diabetic retinopathy. Early Treatment Diabetic Retinopathy Study (ETDRS) Report 22. Arch Ophthalmol 1996;114:1079-84. Ferris FL 3rd, Chew EY, Hoogwerf BJ. Serum lipids and diabetic retinopathy. Early Treatment Diabetic Retinopathy Study Research Group. Diabetes Care 1996;19:1291-3. Klein BE, Moss SE, Klein R, Surawicz TS. The Wisconsin Epidemiologic Study of Diabetic Retinopathy. XIII. Relationship of serum cholesterol to retinopathy and hard exudate. Ophthalmology 1991;98:1261-5. Sundaram RK, Bhaskar A, Vijayalingam S, Viswanathan M, Mohan R, Shanmugasundaram KR. Antioxidant status and lipid peroxidation in type II diabetes mellitus with and without complications. Clinical Science 1996;90:255-60. Parthiban A, Vijayalingam S, Shanmugasundaram RK, Mohan R. Oxidative stress and the development of diabetic complications - Antioxidants and lipid peroxidation in erythrocytes and cell membrane . Cell Biology International 1995;19:987-93. Stratton IM, Kohner EM, Aldington SJ, Turner RC, Holman RR, Manley SE, et al . UKPDS 50: Risk factors for incidence and progression of retinopathy in type II diabetes over 6 years from diagnosis. Diabetologia 2001;44:156-63. Harris M, Klein R, Welborn T, Knuiman MW. Onset of NIDDM occurs at least 4-7 years before clinical diagnosis. Diabetes Care 1992;15:815-9. Bodansky HJ, Cudsworth AG, Drury PL, Kohner EM. Risk factors associated with severe proliferative retinopathy in insulin dependent diabetes mellitus. Diabetes Care 1982;5:97-100. Gillow JT, Gibson JM, Dodson PM. Hypertension and diabetic retinopathy: What's the story? Br J Ophthalmol 1999;83:1083-7. Kitano S. Blood pressure control and diabetic retinopathy. Nippon Rinsho 2003;61:1172-4. UK Prospective Diabetes Study (UKPDS) Group: Tight blood pressure control and risk of macrovascular and microvascular complications in type 2 diabetes: UKPDS 38. BMJ 1998;317:703-13. Kim CH, Park HJ, Park JY, Hong SK, Yoon YH, Lee KU. High serum lipoprotein(a) levels in Korean type 2 diabetic patients with proliferative diabetic retinopathy. Diabetes Care 1998; 21:2149-51. Khan, H., Ishaq, M., Ameen, S.S., Hashim, R., Arain, M.A., Iqbal, Z.